Cherries that have been pitted and had 75 to 85 percent of the moisture removed through some type of drying process. The cherries are pitted and sometimes sweetened before they go through the drying process. 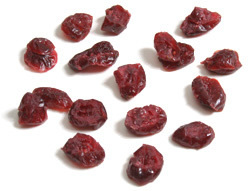 There are several drying processes used to dry cherries. 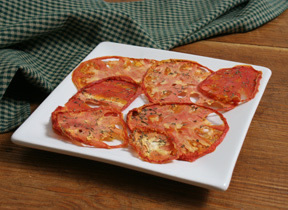 They are dried by air-drying, sun drying, kiln drying, drying in dehydrators, or by drying in a slow oven. 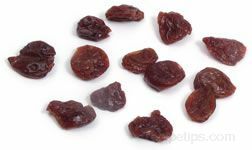 Dried cherries can be stored almost indefinitely because as most of the moisture is removed, natural sugars are accumulated. 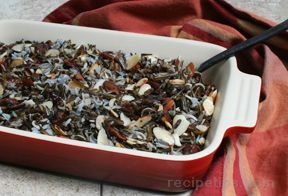 The dried cherries can be used in cakes, cookies, desserts, muffins, and stuffing. 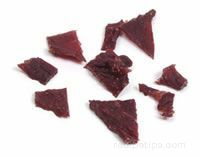 They can be added to hot or cold cereal and they make a great out of hand snack.